Right now you are viewing Best Choice Products 3-Wheel Folding Pet Stroller Travel Carrier Carriage For Cats And Dogs which is one of our numerous available strollers from the manufacturer Best Choice Products. Pick this great stroller right now or search through our website for other similar options. 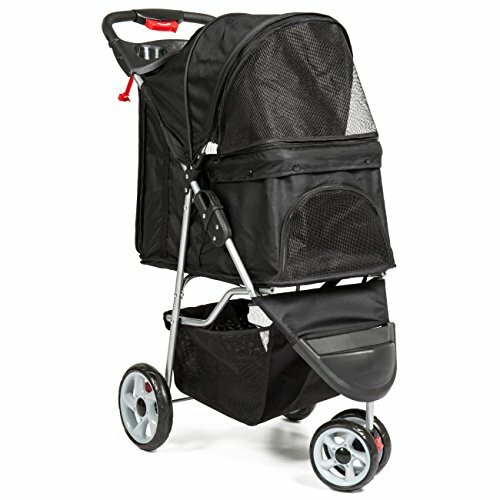 Pet stroller has a large padded main compartment with 2 built-in leashes and 3 zippered access points (top, bottom, and rear) that can open completely for easy access to your furry friend Each access point has a mesh window for safety and ventilation, and an additional mesh window on the top allows you to keep a close eye on your pet With 2 cup holders, a center tray, lower storage basket, and one-button folding design, this stroller is convenient, portable, and perfect for travel Lightweight but sturdy construction can support pets up to 33 pounds, and 2 locking rear wheels ensure your pet's safety Overall Dimensions: 33.5"(L) x 17.5"(W) x 39"(H); Weight Capacity: 33 lbs.